This is review No. 3 of 16 in the first round of our competition. Each review will compare four burritos, with my favorite advancing to Round 2. Today I visit the Deep South, where I learn that Southerners are experts when it comes to cooking meat and creating logos, but have no idea what a good tortilla is. If you’re in Nashville and you’ve overdosed on the city’s greatest culinary treasure, pork, you should go to Baja Burrito for the brisket. The rest of the burrito is good, not great, but the brisket alone is worth a trip. When I arrived on a blindingly sunny weekday, the nice burrito-maker behind the counter tried to steer me toward the “chipotle chicken” (shredded chicken with a thin red sauce in this case), graciously offering me a taste before I ordered. The chicken was almost entirely flavorless, but luckily a little alt-weekly research had steered me toward the brisket. That burrito came stuffed with several thick pieces, each the length of my hand and the color of deep, reddish-brown chili. After selecting a meat, you come to an area on the assembly line with a dozen small metal trays piled with fixings. Asking for cilantro gets you a heaping supply, enough to last the whole burrito. There seem to be two ways of preparing a pre-made tortilla — adding liquid or removing it. I am absolutely a fan of the latter. Baja steams its tortillas, which makes them chewy and left me peeling tinfoil flecks off the floury folds before I could dig in. I also had a sour cream epiphany watching my burrito make its way down the line. A glop of sour cream was the last thing added before origami time, which inevitably left me with white, goo-only bites. Thinking back to my favorite burritos so far, one common denominator has been that the sour cream was added earlier (or a thinner, Mexican-style crema was used) so that it filled in around the other ingredients. I’m not sure why more places haven’t figured that out. Negatives aside, this is more than just the only burrito in town, it’s a good burrito. Baja also sells popsicles from a local shop called Las Paletas, the best of these heavenly Mexican frozen treats I’ve ever had outside of their native country. And they have a killer collection of free bumper stickers. My favorite reads, in simple black and white, “Yo Quiero Baja Burrito.” Damn straight. 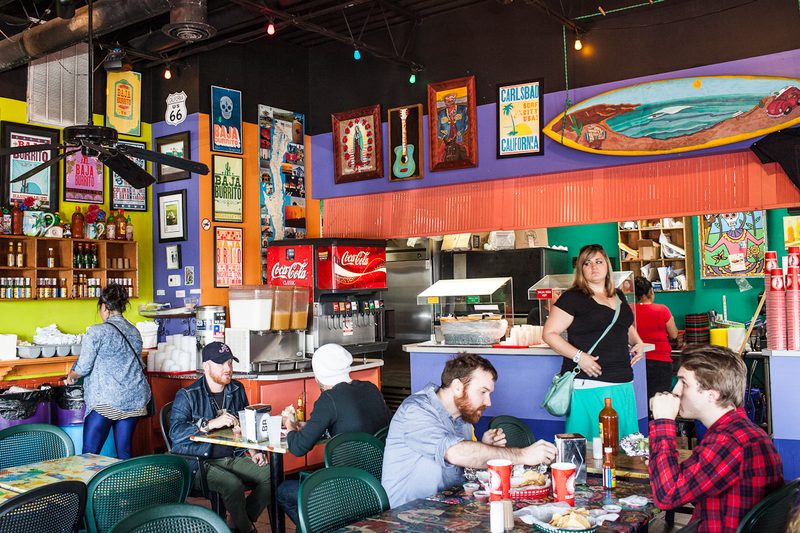 From Nashville, I drove to Atlanta and headed straight to Bell Street Burritos to get started on a busy day of eating. The first address to pop up on Google Maps was the original location in the Curb Market, a nearly century-old farmers market north of the town center. But knowing I’d want to stay a while (and hoping for a picturesque place to slice open and photograph a burrito), I went to the Peachtree Street location. It’s pretty: White subway tiles cover the walls, marble table tops are paired with big wooden benches, and a front wall of windows filters in the afternoon light. Bell Street is written in dark tiles that recall New York City subway stops. 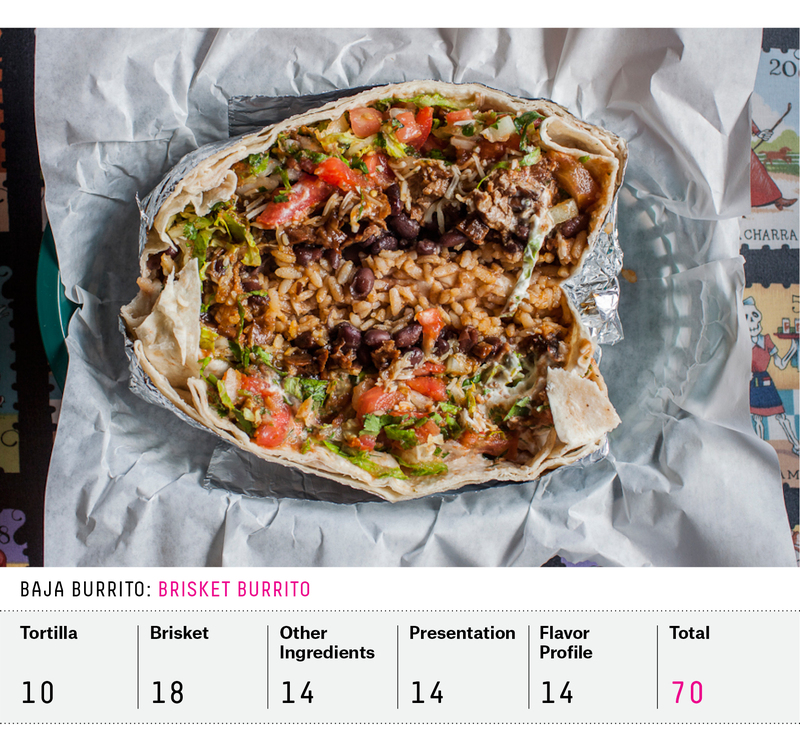 Bell Street has a bit of an unfair advantage in the Burrito Bracket. 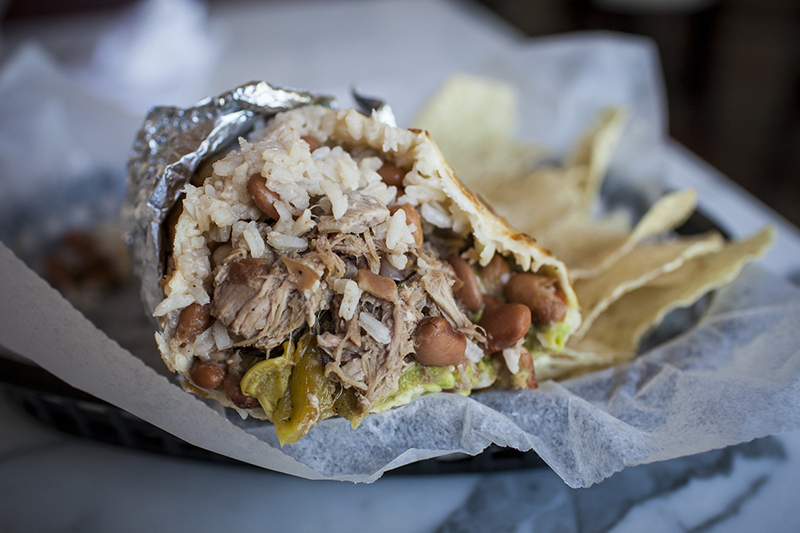 It’s located in Burrito Selection Committee member Bill Addison’s hometown of Atlanta, and the longtime food critic told me exactly what to order: pork and green chilies, griddled tortilla (50 cents extra), and a side of guacamole, mixed in or on the side. Bell Street is thoughtful in its approach and ingredients. The green chilies caught me by surprise; they were cut in long, thin strips, blistered and glowing from the kiss of an oven, perfectly astringent without being bitter. It was a reverence to the green shoulder-less gods I’d previously seen only in New Mexico. The thick chunks of pork were tender and moist. The guacamole was the best I’d had so far. I went during the lunch rush, and the long line past the register led me to believe the word is out on Bell Street’s burritos. At first the burrito tasted much too salty, but as my palate adjusted, it was less of a problem. The rice was buttered, making the burrito feel heavy and introducing an out-of-place flavor. The tortilla was fairly ordinary, but some serious TLC from a griddle turned a liability into an asset. Bell Street also sells sopapillas. And milk shakes. And Mexican Coke. An hour in, as the lunch crowd dwindled, the wait staff seemed ready to see me and my dissection kit go (at each locale, I photograph a burrito cross-section, which involves specialty tools and funny looks). It was time to get some exercise before dinner in nearby Decatur. 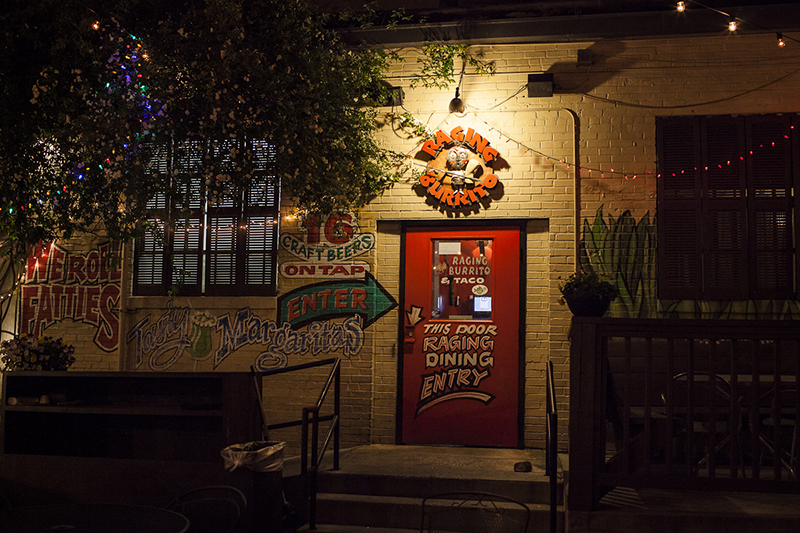 To get to Raging Burrito, you have to walk past Decatur’s largest outdoor patio (and the sign proudly proclaiming that designation) and brightly painted, aggressively cheerful front doors. A winding passage at the entrance will make you feel like you’ve gone astray, but when you get to a colorful dining room with “We roll fatties” written on the wall, you’ll know you’re in the right place. Latin American hippie music (think Spanish renditions of Bob Marley) played from the speakers, aside brightly colored sconces and lamps hanging from the ceiling. Young adults sat at tall tables along the wall, happily occupied by a long beer menu featuring local gems and a best of American craft brews list. I ordered a “raging monster,” which came with a choice of two meats and three veggies. I opted for carnitas, jalapeño, salsa fresca and cilantro. The monster also came with onion, lettuce, cucumber, sour cream, jack and cheddar cheese, rice and guacamole. True to its name, this was a massive bundle of food. The tortilla was unfortunate, thick and overbearing. But the carnitas were delicious, stewy and tender. In spite of its girth, which should make it hard to get things in the right proportions, this burrito isn’t bad. Chunks of jalapeño added heat, and the salsa was fresh, if a bit boring. 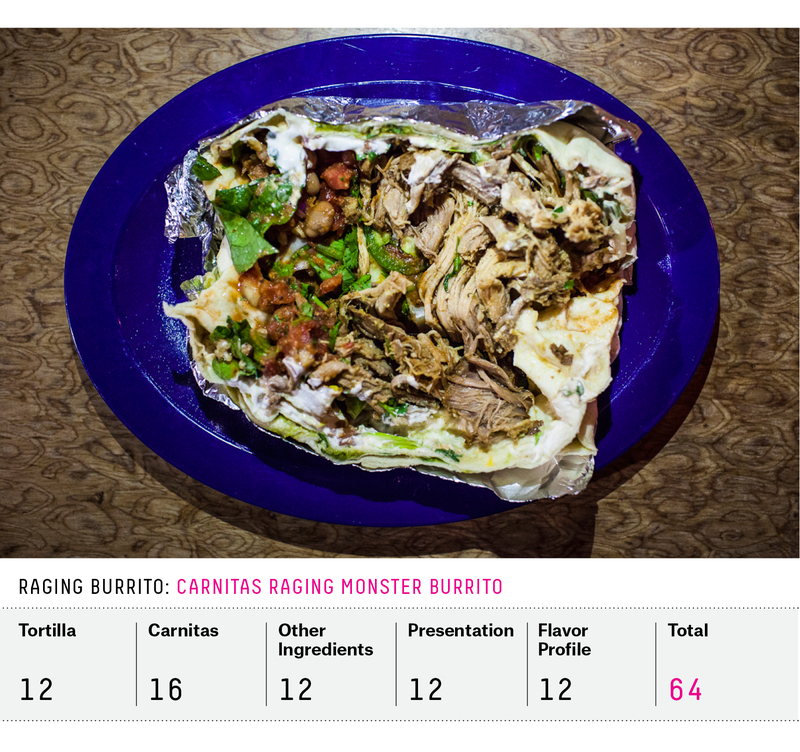 I’d read that Raging Burrito had several locations in its heyday, when world food burritos were all the rage. The owners have pared back down to just the original location. If they can get the rest of the ingredients up to par with the carnitas, they should be around for a long while. No one in her right mind should go to New Orleans to eat burritos. Beignets, gumbo, po’boys, crawfish … those would be worthy of a culinary pilgrimage (and I managed to eat them all in my very short stay), but not burritos. Nothing about the Burrito Bracket is particularly sane, however, and judging by the crowds at Juan’s Flying Burrito I wasn’t the only one in town in search of Mexican food. On a Thursday at 2 p.m., a throng huddled under construction scaffolding at Juan’s Magazine Street location, waiting for a table to open up. Tattooed waiters and waitresses and a killer logo are the first things you’ll see when you enter Juan’s dark interior. Everything from the walls to the wax paper bears the insignia of a donkey with wings. 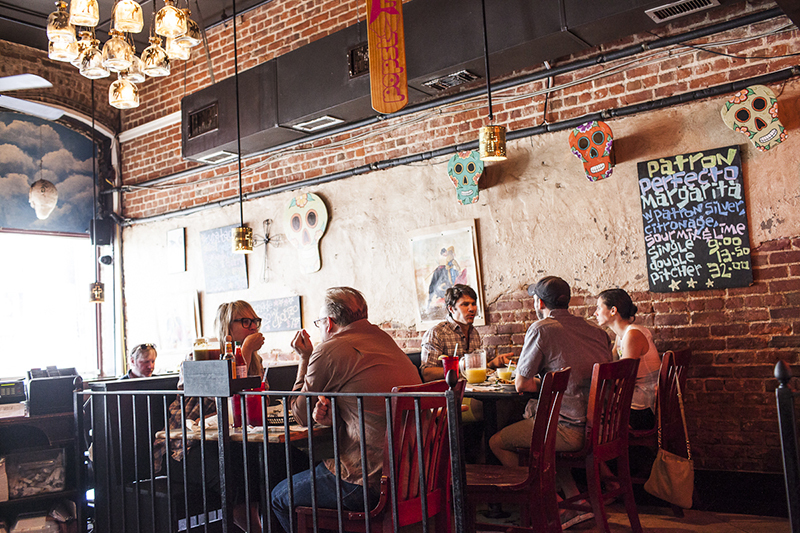 Juan’s calls itself a creole taqueria, and the signature Flying Burrito certainly falls in this category. Despite containing three kinds of protein, this is not a gargantuan dish. Grilled steak, shrimp and chicken are embedded amid yellow rice, black beans, cheese, sour cream and guacamole in a dense and thick tortilla. I started to fear that good logos and tasty tortillas might be mutually exclusive in the South. The creole influence on the flavors was not subtle, a slightly odd combination with the Mexican-style salsa. 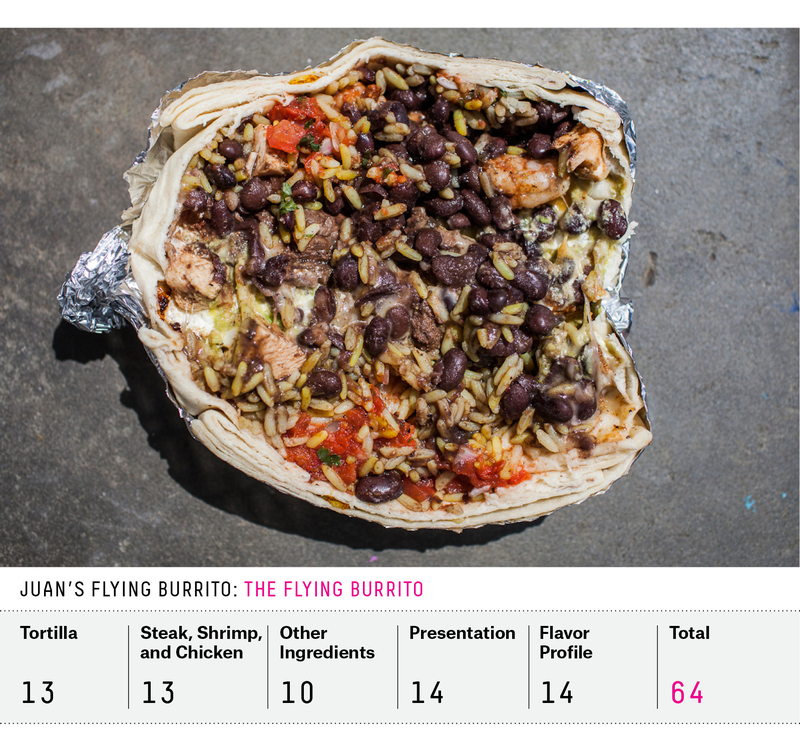 I’m not a huge fan of surf and turf inside a burrito, but Juan’s did it pretty well, particularly combining the textures of the three proteins. The rice and beans had a Nawlins flavor profile, though they were a bit too reminiscent of “Cajun style” boxed Rice-a-Roni. The next day, I watched as a parade moved through the Bywater, a neighborhood opposite the canal from the Lower Ninth Ward. Recitations were done in both Spanish and English, so I spoke to some of the Spanish-speaking attendees. A couple told me they used to live in the gentrifying neighborhood but have recently been priced out. Three Mexican families said they moved to New Orleans post-Katrina to take advantage of cheap rents and available work. Throughout my time in New Orleans, people spoke of an influx of taco trucks since the hurricane that gave them hope for the future of Mexican food in the Crescent City. 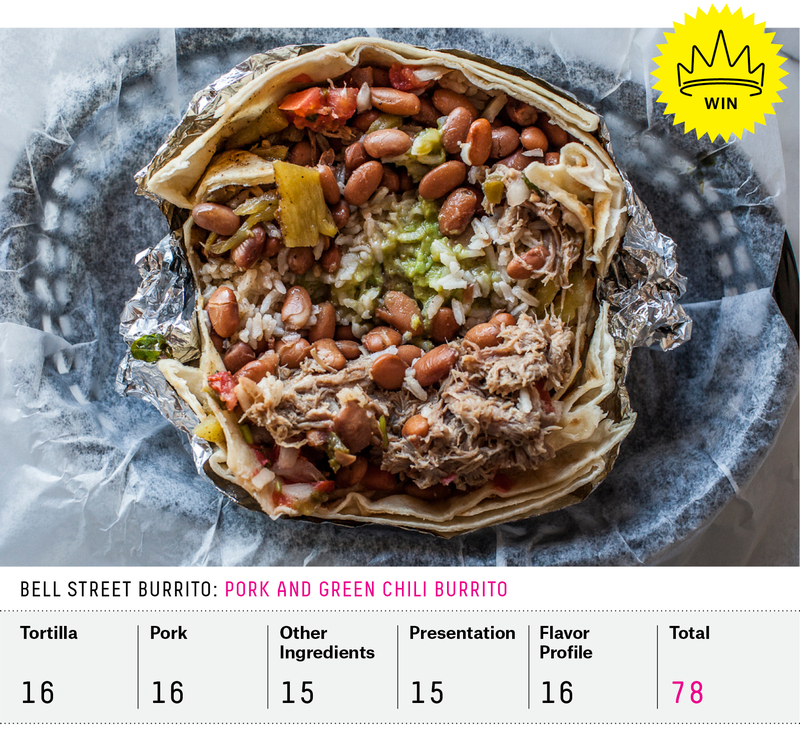 Bell Street Burritos’ pork and green chili burrito takes it.